There’s strength in numbers and much to be gained in pooling energy and resources for promoting humanities scholarship and teaching. At the same time, there can be local circumstances that may benefit from a more local and customized approach, especially when physical proximity allows for face-to-face meetings. The local chapters of 4Humanities are intended to function as a complement to the international 4Humanities initiative. See how you can start a local chapter. Below is some boilerplate text that might be adapted to propose a local node of 4Humanities at your institution. Please let us know if you’re interested! 4Humanities includes scholars, students, and others engaged in advocacy for the humanities in the U.S., U.K., Canada, Australia, Italy, Greece, Mexico, and India (current locations). It provides an online platform for humanities advocacy that reports about, publishes, and creates materials addressing the value of the humanities in society. Materials include: advocacy statements and campaigns, “student voices,” showcase examples of humanities research, news about the crisis of the humanities in society, accessible scholarship on the state of the humanities, and monthly bilingual reports about the humanities from graduate-student or early-career “international correspondents” around the world. On the drawing board are plans for a “Humanities, Plain & Simple” initiative (soliciting short, accessible statements, e.g., from well-known people in society), an exhibition of publicly-oriented humanities research, multimedia and social networking projects (e.g., 1-minute videos for the humanities), and other creative/thoughtful projects. 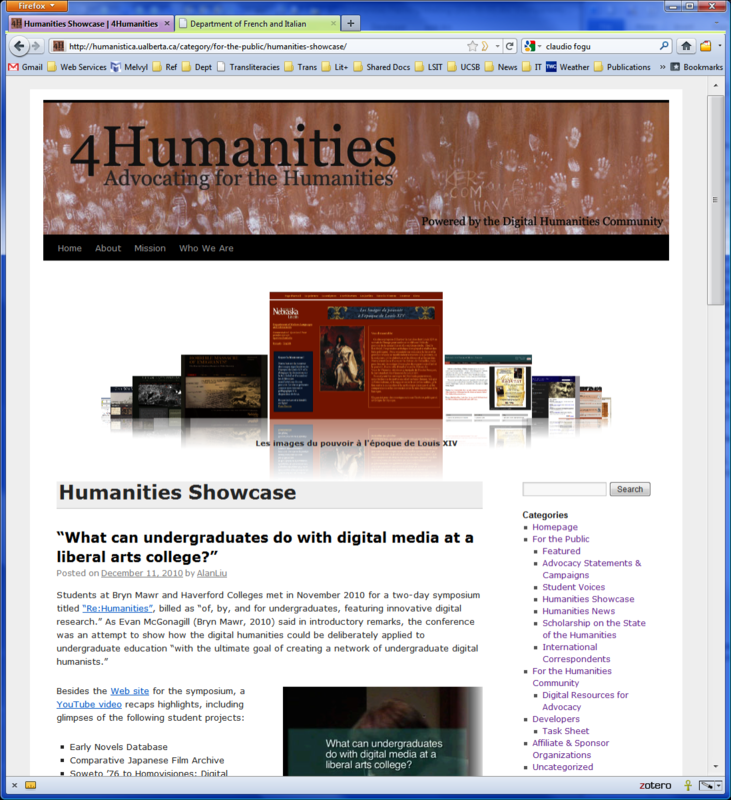 In addition–as indicated by its motto, “Powered by the Digital Humanities Community”–4Humanities is based on the special premise that digital new media today has a special role to play in effective humanities advocacy. 4Humanities connects the international digital humanities community with the humanities at large in a common cause. The 4Humanities@YourInstitution Research Focus Group will be an institutionally-embedded, local node of the 4Humanities Collective. It will leverage the global activities of the 4Humanities Collective while emphasizing local strengths and opportunities. True to the distributed, networked ethos of the larger initiative, however, 4Hum@YourInstitution will seek opportunities to link up with other relevant local groups (possibly including new local nodes at other institutions in the region). The potential of digital media, multimedia, and social media for advocating the humanities (e.g., research into relevant tools and research directions in the digital humanities field as well as social-science ICT [information and communication technology] fields). A typical meeting of 4Humanities@YourInstitution will begin with scholarly discussion of readings, and then conclude with project planning and workshopping. In addition, meetings will typically include Skype “Group Video” conferencing (or its equivalent) so that affiliates from other institutions can participate (e.g. participants in the broader 4Humanities initiative). Budget allowing, 4Humanities@YourInstitution will also host one face-to-face colloquium each year with members of its extramural affiliates. Like the group’s regular meetings, this colloquium will also have a dual nature as a scholarly research meeting and a planning/project meeting. Budget allowing, it will include a keynote guest-participant (e.g., such well-known and/or strategically well-placed spokespeople for the humanities or digital humanities as […] ). 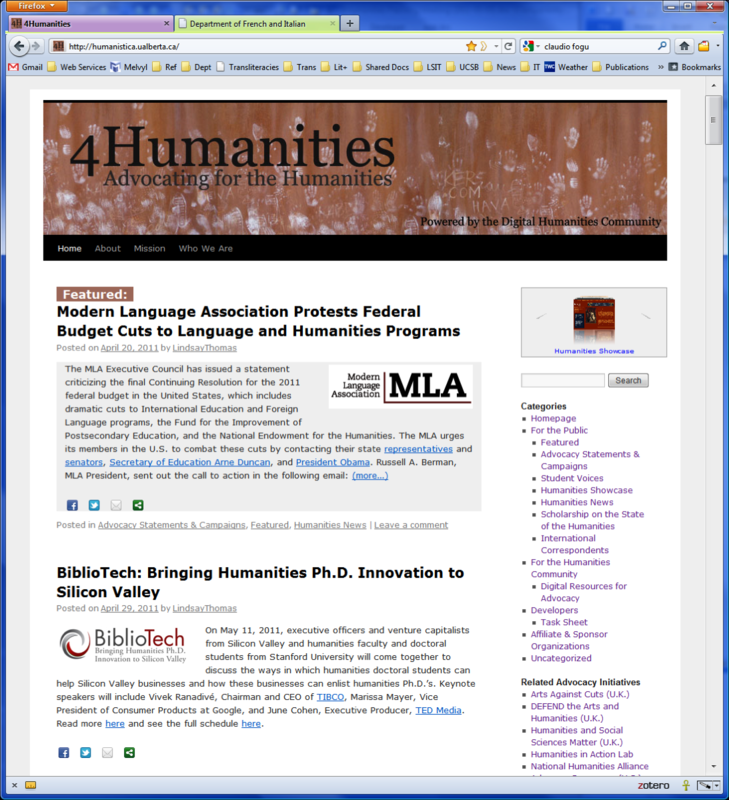 4Humanities is a site created by the international community of digital humanities scholars and educators to assist in advocacy for the humanities. Government and private support for the humanities—for research, teaching, preservation, and creative renewal in such fields as literature, history, languages, philosophy, classics, art history, cultural studies, libraries, and so on—are in decline. In some nations, especially since the economic recession that started in 2007, the decline has resulted in major cuts in government and university funding. Leaders of society and business stake all the future on innovative and entrepreneurial discoveries in science, engineering, biomedicine, green technology, and so on. But the humanities contribute the needed perspective, training in complex human phenomena, and communication skills needed to spark, understand, and make “human” the new discoveries. In the process, they themselves discover new, and also very old, ways to be human. They do so through their unique contribution of the wisdom of the past, awareness of other cultures in the present, and imagination of innovative and fair futures. Many people care about the humanities, not just in the educational and cultural institutions directly affected by the recent cutbacks, but also in business, government, science, media, politics, the professions, and the general public. They believe that society will be poorer, not richer, without the humanities to help us grasp, and evolve, what it means to be “human” and “humane” in today’s complex world. I’m working on developing the UCI group, and it’s very helpful to see this framework laid out! We’re thinking of trying to raise interest in the project at the new student orientations at the beginning of the year. I was wondering if anyone has experience/advice/suggestions in terms of recruiting members?